This vanity has both an all-around look and a traditional style. This piece comes with a beautiful brown solid wood base and a white marble counter. Put a nice touch on your bathroom's look with this vanity set from Wyndham Collection. Add this vanity to your bathroom for more traditional style in your home. The white marble counter and brown solid wood base make a beautiful look in your bathroom. The simple look of the double-door cabinet and drawer is useful and classic. Redo the style of your bathroom with this classic from Wyndham Collection. Use this vanity to bring more traditional style into your bathroom. The white marble counter and brown solid wood base make a beautiful look in your bathroom. Room is no problem with this vanity because it comes with a double-door cabinet and drawer. This classic set from Wyndham Collection will make your bathroom look brand new. Bring a fresh, traditional look into your bathroom with this vanity. Its white marble counter and brown solid wood base will look beautiful in your home. Room is no problem with this vanity because it comes with a double-door cabinet and drawer. Make your bathroom look like new with this good-looking, useful set from Wyndham Collection. Sheffield 80-inch W 5-Drawer 4-Door Vanity in Brown With Marble Top in White, Double Basins This vanity has both an all-around look and a traditional style. This piece comes with a beautiful brown solid wood base and a white marble counter. Put a nice touch on your bathroom's look with this vanity set from Wyndham Collection. 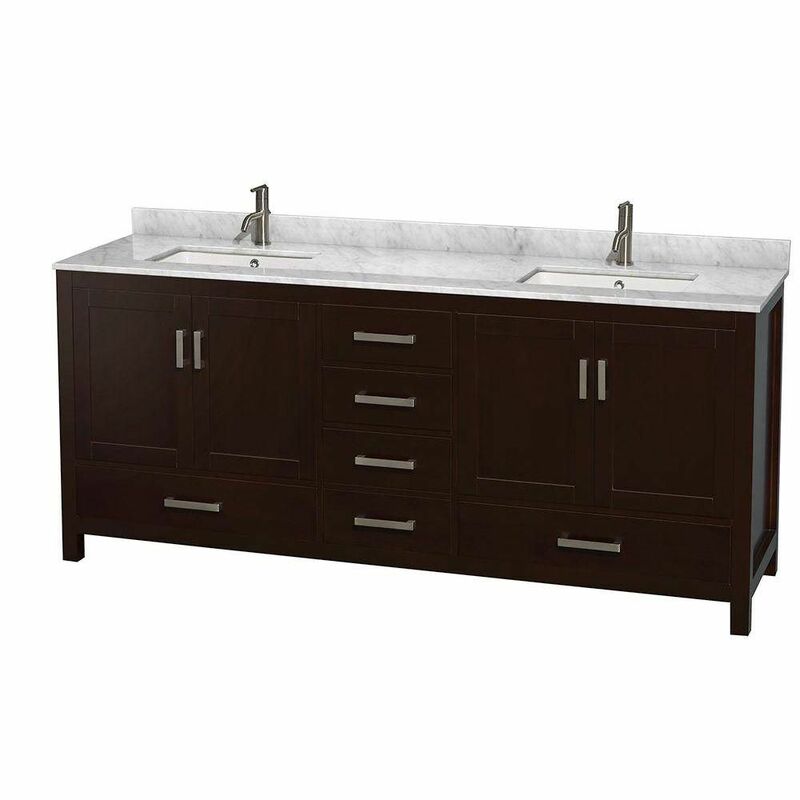 Sheffield 80-inch W 5-Drawer 4-Door Vanity in Brown With Marble Top in White, Double Basins is rated 5.0 out of 5 by 4. Rated 5 out of 5 by MS from This vanity came in two pieces. All arrived with no issues.We love how the espresso finish looks ... This vanity came in two pieces. All arrived with no issues.We love how the espresso finish looks great against the new floor tile. We priced "discount" cabinet companies but were able to catch a Home Depot sale price with Free shipping. Saved money. Would definitely recommend this vanity to anyone doing a new or remodel bath. Also the carrara white marble top looks fantastic. Rated 5 out of 5 by David from The vanity was delivered ahead of schedule and was in... The vanity was delivered ahead of schedule and was in perfect condition. A job well done, thanks. Rated 5 out of 5 by GoodDay from I am extremely happy with the vanity. The expresso against the carrara marble is simply beautiful... I am extremely happy with the vanity. The expresso against the carrara marble is simply beautiful. In addition, the vanity offers ample storage.